This paper presents a finite element method for the analysis of scissor-link foldable structures. These structures are capable of deforming from compact form to expanded form, and vice versa. 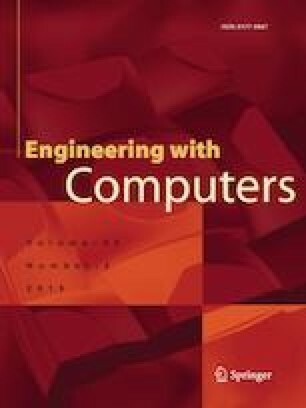 Due to their complex mechanism, it is difficult and time-consuming to simulate foldable structures in analysis softwares, while the proposed method of this paper makes it easy to perform the analysis in a simple manner. In addition, this paper uses two different multi-objective meta-heuristic algorithms, NSGAII and MOCBO, to perform optimum design of foldable structures. The purpose is to find designs that result in minimum weight and minimum volume of the structures satisfying all the constraints consisting of maximum stress, elements buckling, and permissible displacement.